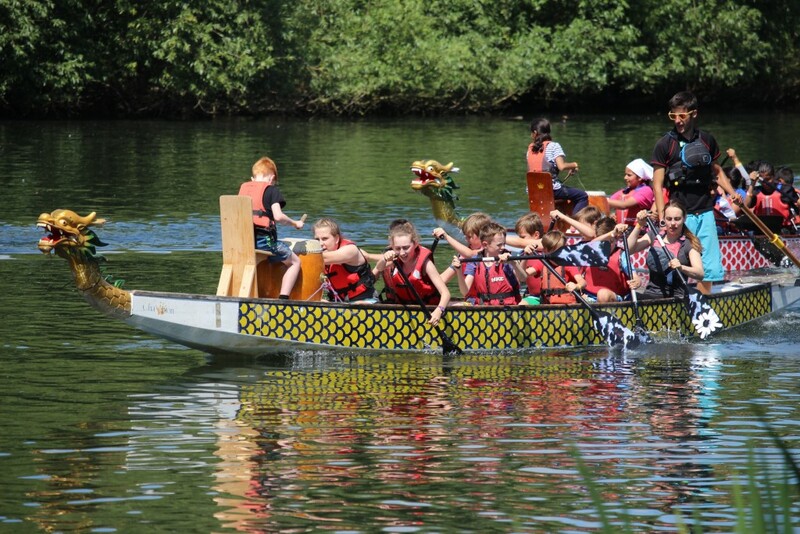 Merlin Scouts took to the water on Sunday 2nd July to take part in the Annual District Scout Dragonboat Regatta at the Wokingham Waterside Centre. The team of 10, plus Drummer to set the pace, streaked through its qualifying heat to grab a place in the semi final where it unfortunately met its match from much older teams. 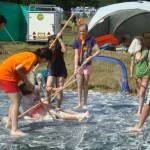 Not to be down hearted, the Scouts made the best of a blisteringly hot day by throwing themselves into the many activities there (climbing wall, bouncy castle etc) alongside hundreds of other Scouts. 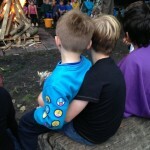 Steve Capel was officially invested as 1st Woosehill Scout’s new Group Scout Leader (GSL) at the Group’s first joint campfire, attended by all Sections. 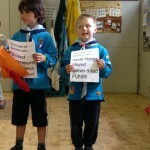 Steve joined new Beavers and Scouts as they took their Promises and reaffirmed that he would ‘do his best’ as he received the Group’s distinctive blue necker from youngest Scout. Following the ceremony, everyone gathered round the roaring campfire to sing songs and enjoy hot chocolate, marshmallows and cakes. 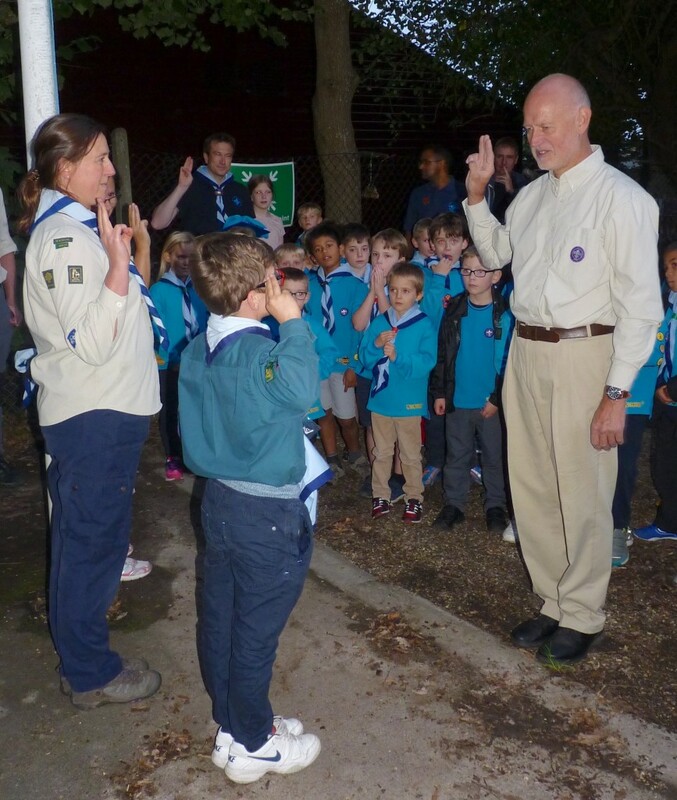 A great way to mark a new era for 1st Woosehill, welcoming newbies to the Scouting family and marking the start of a new school year for returning youngsters. 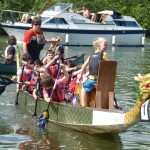 On a blisteringly hot day in June Merlins scouts competed in the Berkshire Scouts Dragonboat Regatta held at Wokingham Waterside Centre. By the 4th race the exhaustion was only being overcome by adrenaline! The competition was fierce, but a mixture of fantastic team work and determination helped the Merlins scout team to a stunning victory. All the effort was worthwhile for the smiles and excitement when they lifted the cup at the end of the day. Congratulations champions! 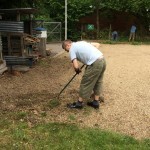 Thanks to all those who turned up to help us clear up the grounds around the hut today. 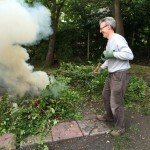 Many hands made light-ish work and it’s great to have the place looking good for the BBQ next month. 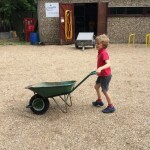 There will be plenty of other opportunities to help out over the next few months so watch this space! Before Christmas Merlins scouts had a visit from a Shelterbox representative to explain to us what the charity does and show us the contents of an emergency box. 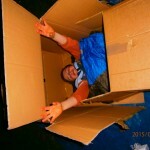 To follow on from this visit the scouts decided to raise some money to support Shelterbox, and they would do this by getting sponsored to spend a night in a cardboard box. 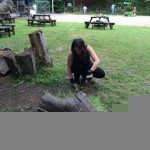 They liked this idea because they felt it would give them a small taste of what it would be like to have no home. 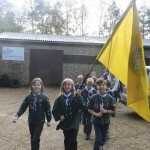 On a cold night in March 10 scouts managed to do this, and some even slept pretty well! 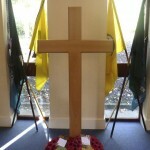 Flags from the Beavers, Cubs and Scouts of 1st Woosehill Scouts were proudly displayed for the first time at Woosehill Community Church when they attended the Remembrance Day service there on Sunday 9th November 2014. 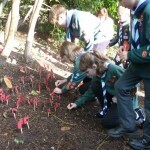 Reverend Patrick King welcomed the 50 plus children, teenagers and their leaders as he presided over the service that culminated in the youngsters ‘planting’ their handmade poppies in the ground outside the Church. I really enjoyed the book, the main character and storyline about a murderer. I have already read another book in the series, which I thoroughly enjoyed and have the other 2 on order. Theodore Boone is a really good book about a little boy who’s mum and dad are lawyers. There is a murder trail in Strattenburg and Theo Boone is the only one who knows the truth. 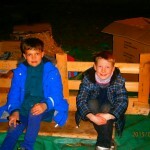 I liked the judge Henry Gantry because he is a nice person who is open to everybody. I did not like the bit when April’s mum and dad were divorcing because I found it a bit pointless. I think people who are interested in law or who want to get a job should read this book as it will show them what court is about. 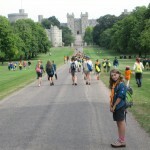 This summer Merlins and Buzzards scouts joined together to take 40 scouts to WINGS, an international camp which takes place in Windsor Great Park every 5 years. 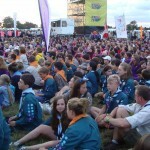 There were about 6000 scouts and guides from about 30 countries. The fields were buzzing with different languages with the iconic Squircle at the heart. 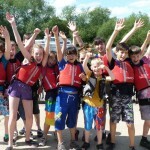 Activities available were incredibly varied and included wheelchair racing, overground caving, rifle shooting, rafting, mop hockey and Bollywood dancing! 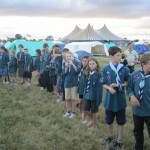 Learning about other cultures during the World Fair, swapping badges with groups from near and far and the lively night life all made vivid impressions on scouts and leaders alike. Even the Quarter Finals of the 2014 Football World Cup couldn’t keep people away from the 1st Woosehill Scouts AGM and BBQ on Saturday 5th July! More than 50 people arrived early in the evening for the AGM where they learned about the Group’s activities, watched a presentation of photos taken at the varied adventures the Sections had undertaken in the past 12 months and were entertained by the Swifts and Kingfishers Beaver colonies as they acted out the Robin Hood song and told guests the things they had enjoyed doing during the year. 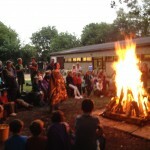 Official proceedings over, scores of adults and children arrived bringing the total to 172 people who tucked into a tasty BBQ and enjoyed games and camp songs around the fire! 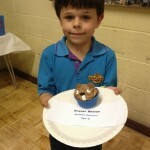 Generosity was the order of the evening with a Cupcake Competition and Sale raising £50 for Cancer Research and ticket and refreshment sales adding £1,000 to 1st Woosehill’s funding raising account. Thank you to all who attended and gave so generously. 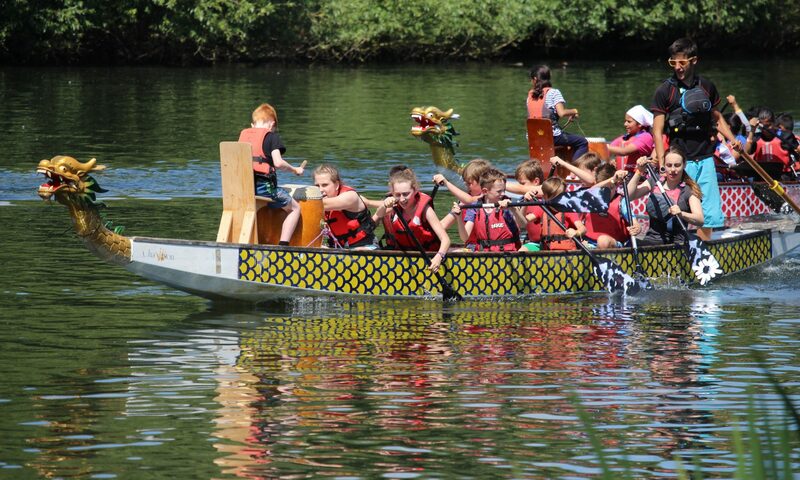 Scouts from both Merlins and Buzzards sections entered the Berkshire Dragon Boat Regatta at the Wokingham Waterside Centre on the 8th June. They were joined by 250 others for a glorious summer day on the Thames. With grit, determination and the usual amount of competition shown between the two 1st Woosehill sections, Merlins managed to secure a place in the semi-finals. However, getting their hands on the Trophy was not to be this year. 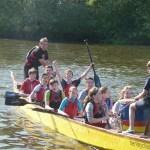 1st Wokingham took home the Scout Trophy through an excellent display of coordinated paddling. 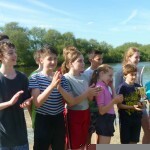 Despite the lack of silverware, everyone enjoyed the day, basking in the Berkshire sunshine between races and taking advantage of the refreshments, especially the Ice Creams.